Fleet Pond From The Air – Islands Too! 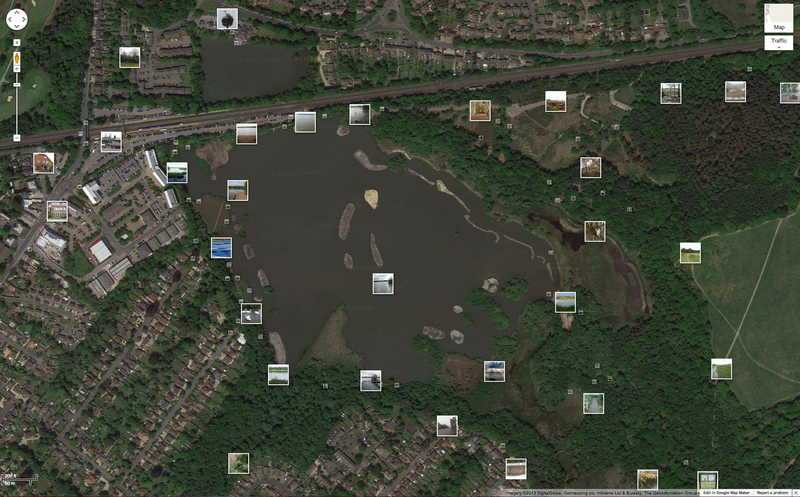 The screenshot above is a great aerial view of the new islands at Fleet Pond and was obtained by using Google Maps (GM). 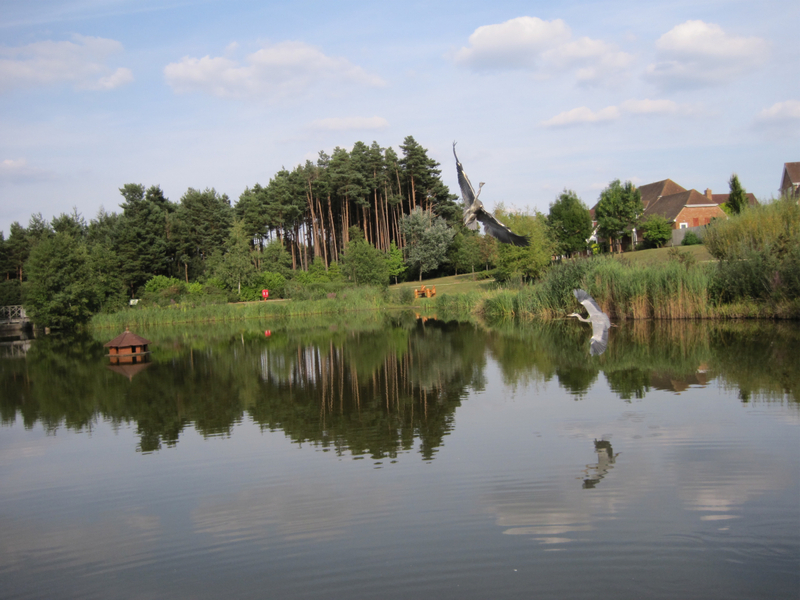 After selecting the appropriate area in GM, if you click on the Photos option on the upper rhs you also get an interesting selection of pictures taken around the pond – see screenshot below. Another interesting and similar photo site is mentioned here. 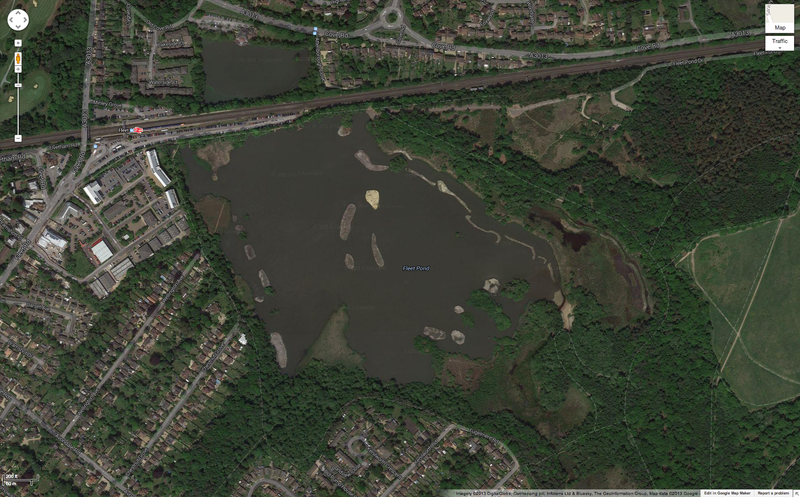 For a much older aerial shot of Fleet Pond, and as way of comparison, see here. 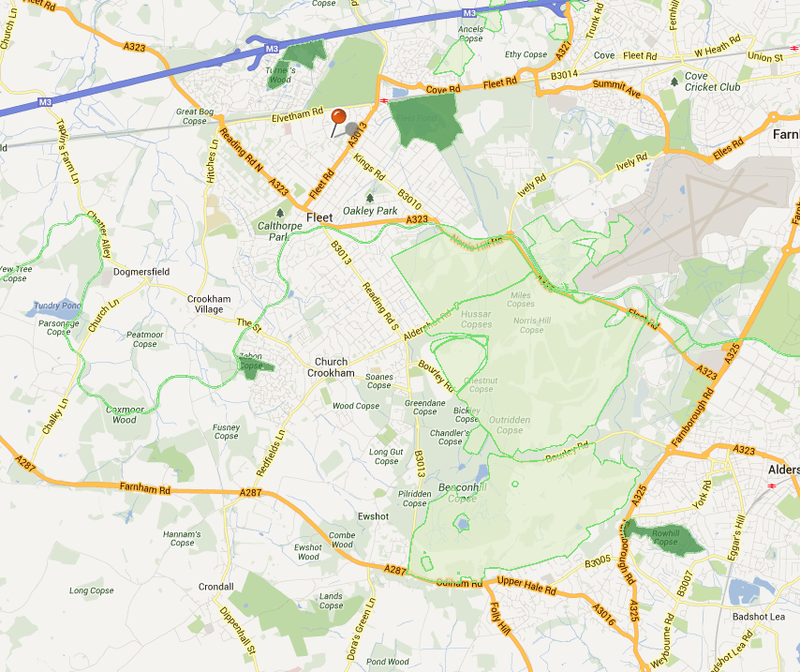 Image attributes: Google Maps UK, and the third-party data providers are specified in the lower rhs of the above images. “The atrocious weather during 2012 was expected to have a disastrous effect on the butterfly population in 2013 and, sure enough, there were so few butterflies around during the spring that I have written about this in an article for the autumn edition of the Fleet Pond Society (FPS) newsletter. A really hot July seemed to reverse the trend, as suddenly there were butterflies everywhere. A “Butterfly Count” run by “Butterfly Conservation” from 20 July until 11 August showed that 15 of the 21 species listed had actually increased in numbers and 12 of those were up by 50%. The Small White topped the chart with the Large White second, which was surprising bearing in mind how few of them were around during the spring. Numbers of these two butterflies were up 300% compared with the “Butterfly Count” last year. The biggest surprise for me was to see as many as 18 Small Tortoiseshell butterflies on one day. This particular species was brought almost to extinction by a predator from the continent a few years ago and I only saw 7 in the whole of last year. This year I saw a total of 81. You can obtain the FPS newsletter by joining the Society – details here. Peter has written a number of interesting articles on butterflies at the Pond eg please see here (different locations) and here (different species). There is a general article on UK butterfly numbers for 2013 here. 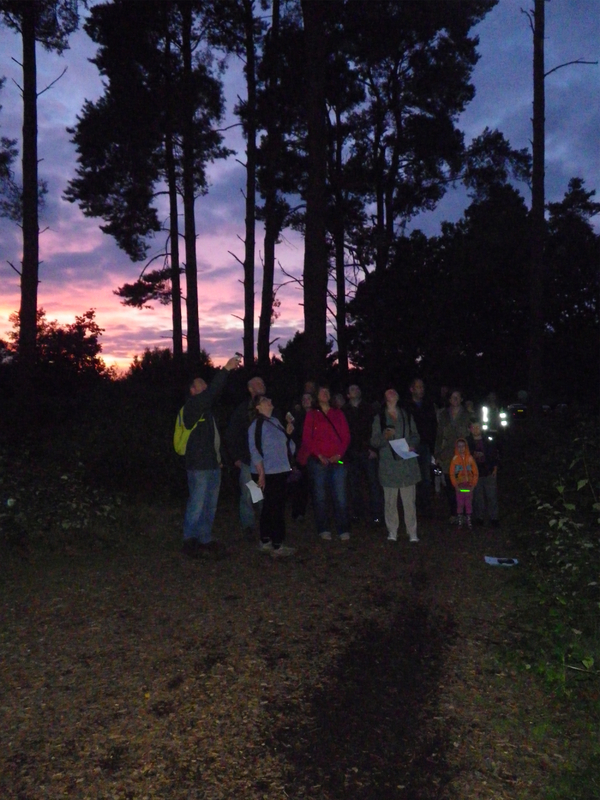 “We had another wonderful evening on Friday’s Bat Walk at Fleet Pond with a good turn out of over 20 keen adults and children. Rangers Rachel and Izzy guided them around Fleet Pond which again did not disappoint and with a warm dry evening there was plenty of bat activity throughout. What a brilliant place Fleet Pond is for bats! Along the woodland paths we saw and heard Pippistrelles and possibly Brown Long-eared bats. This bat has a faint call and exceptionally sensitive hearing, tricky to spot by eye as it often flys high in the tree foliage. Then around the far side of the pond closer to the waters edge we had an impressive display from Daubentons. These bats are known as ‘water bats’ as they swoop down across the waters edge using their large feet or tail to catching insects on the waters surface. Ed. It sounds a fascinating evening! Sunday 22 September Is The Day! 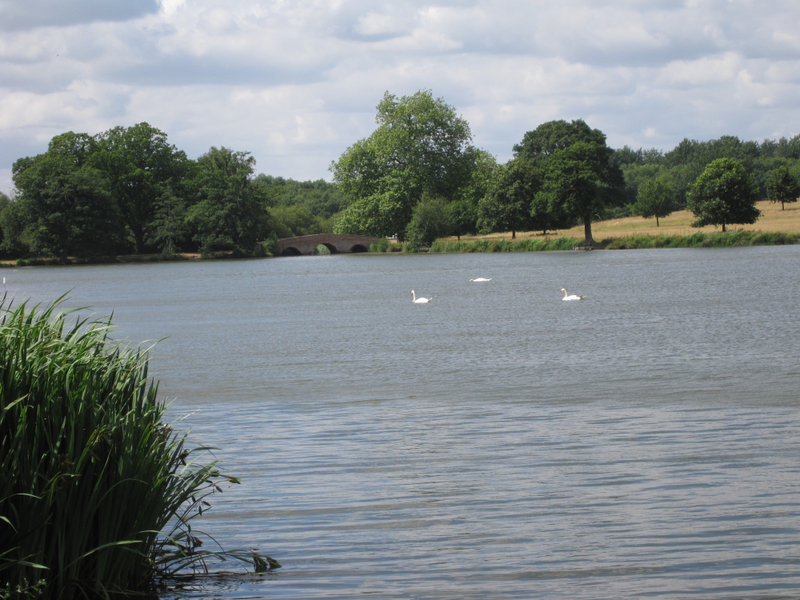 This Sunday, Colin Gray, Chairman of Fleet Pond Society (FPS), will be taking on the challenge of a 21 mile circular trek, visiting a large number of wildlife and environmentally important sites along the way. Full details of the trek can be found here. 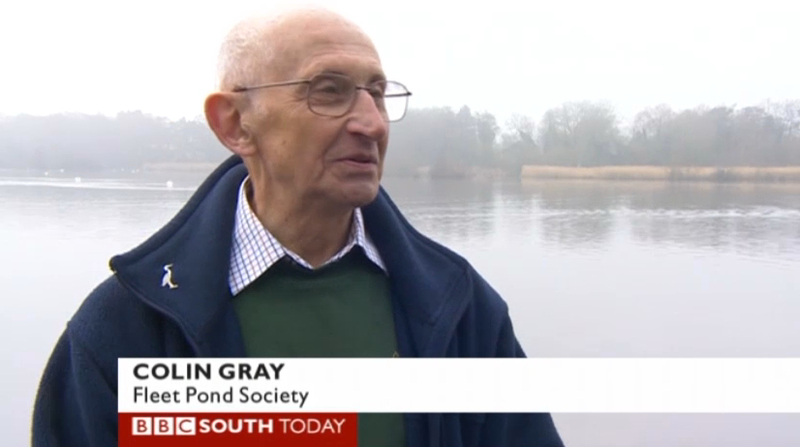 Through FPS, Colin has put an enormous amount of time, effort and passion into conservation activities at Fleet Pond Nature Reserve and this event is one more example of his unstinting commitment! The purpose of the event this Sunday is to raise funds for the Fleet Pond Clearwater Campaign (see here for details). This campaign has already delivered numerous improvements to the pond and additional funds will allow us to take this even further. If you would like to sponsor Colin for this event, please see his fundraising page here – all donations will be extremely welcome. We all wish Colin the very best on the big day! “Rangers Will and Rachel had a great batty evening last Saturday (14 Sept) when up to 30 adults and children turned up to the first (of two) Fleet Pond bat walks! We were so lucky with the weather, it cleared enough so that volunteer Spike could contribute his astronomy knowledge adding to the frenzy of bat activity all around the pond. Great bat friendly weather condition’s enabled us to see and hear at least 3 species of bat. 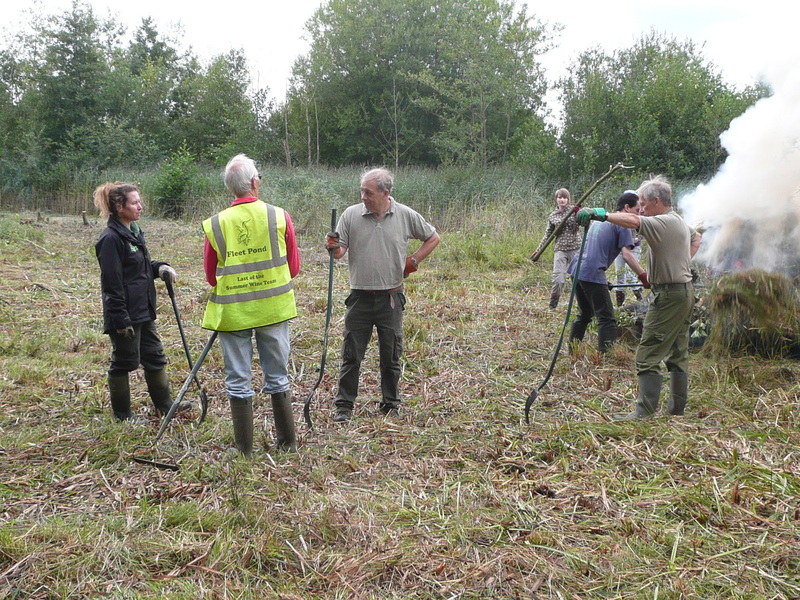 All participants had a great evening, all new to bat detecting and some new to Fleet Pond! We had time to chat a bit about the exciting work that has been going on there and how the wildlife is thriving. As mentioned above, if you missed the first walk and fancy a bat encounter, please pencil in this coming Friday, 20th September: 19:00 – 21:00. Booking and other details can be found here. If you’re curious as to what bat walks are like, take a look here. Colin’s Challenge Trek For Charity – Just A Week To Go! Colin Gray, Chairman of Fleet Pond Society, will be taking on the challenge of completing a round trip trek of 21 miles on Sunday 22 September – quite a distance, and just a week to go! The purpose is to raise funds for the Fleet Pond Clearwater Campaign as well as increasing awareness of local conservation sites and activities. The very interesting photos above and below were taken by Colin during various preparatory treks. A lot of hard work has already gone into planning and practicing for the challenge, let alone actually doing it! If you would like to support Colin and Fleet Pond through this charity event, please see here. In a previous post, a list of the 12 environmentally important sites that Colin will be visiting on his charity trek was given. 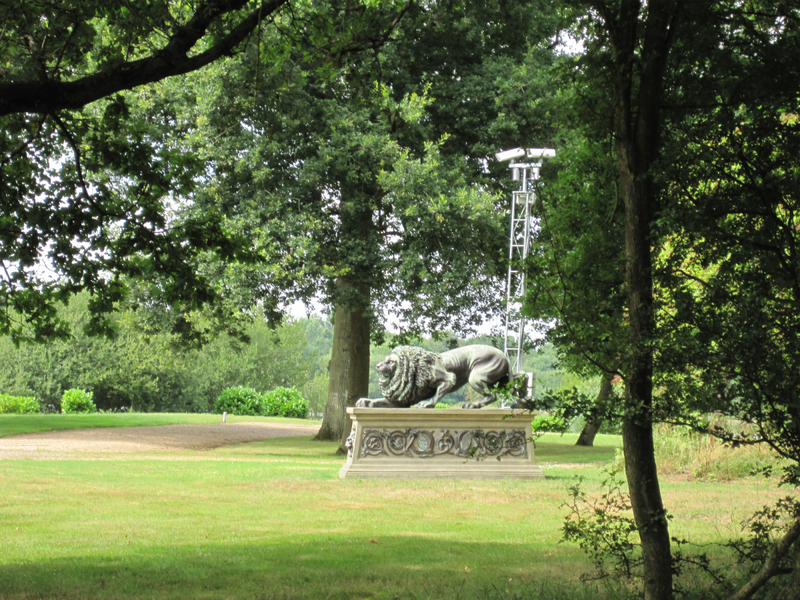 You may not be aware that there are so many such sites in the local area and an interesting way to explore these (in overview) is to use the useful SketchMap site. Type in GU51 at the top and use the boxes on the lhs to explore the possibilities eg clicking Nature Reserves shows the positions of the different sorts of sites (local nature reserves, SSSI sites etc). A snapshot of some typical results is given below. Full details of the individual areas can be found on their associated sites. We wish Colin the very best of luck! The new volunteering season has now started and with a very busy beginning! Last Sunday, volunteers from Fleet Pond Society (FPS) and others met in the morning to clear alder and scrub, producing a very impressive fire (glimpsed in the picture above). In the afternoon, the 1st Aldershot Scouts arrived at another part of the Pond to help clear that – as you can see, the rain did not deter them! The brave Scouts – the bad weather didn’t deter them! Then, on the following Monday, volunteers from Dimension Data arrived. “The team at Dimension Data turned up at Fugelmere Marsh regardless of the black sky and rain fall! 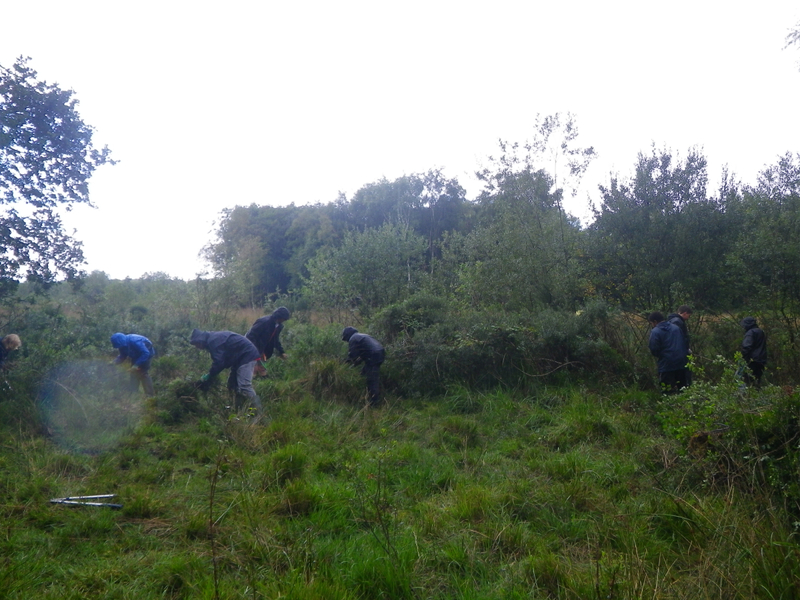 A goal was set out on the challenging terrain to clear scrub up to a tree line. In two hours this was accomplished with only a few bits left out. 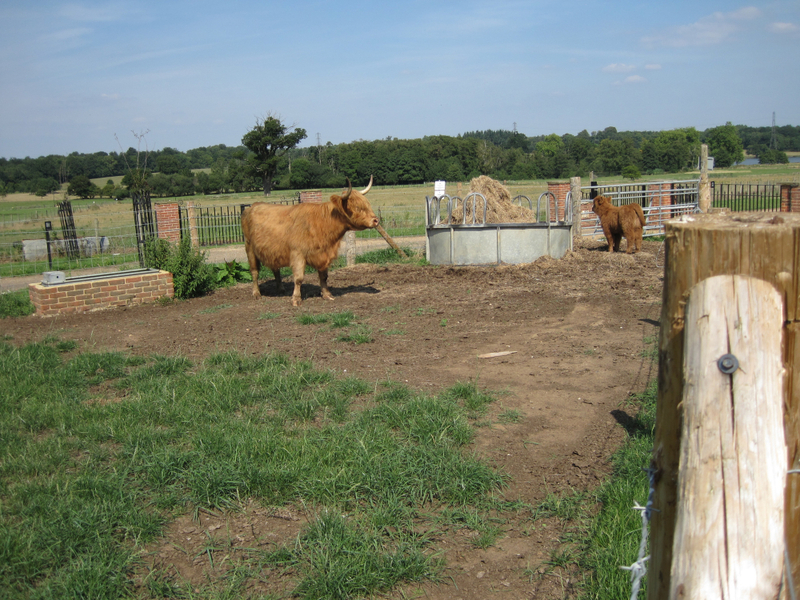 This job was important to help the Countryside service team to manage the rare marsh habitat for wildlife that’s dependant on it. Finally, tomorrow, Friday 13th September, SSE return to complete conservation worked started the previous Friday. 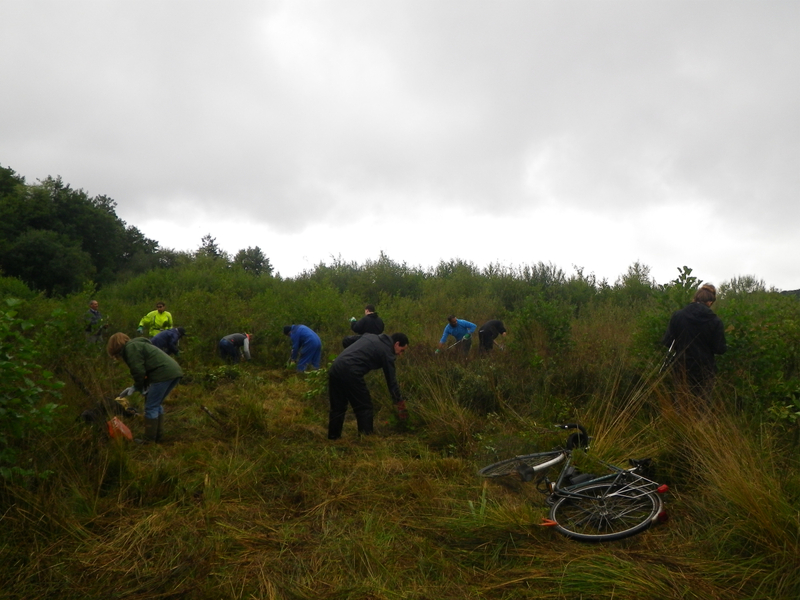 Many thanks to all who contributed, the volunteer work makes a significant difference to the overall state of the nature reserve and is greatly appreciated. You are currently browsing the Fleet Pond Blog blog archives for September, 2013.